Michael Soskil, an online colleague, started a conversation this morning about tests. That tests, especially standardized tests, are not of any real value to students. I read an article this morning about the ACT Aspire test and how it will be taking the place of other standardized assessments ACT currently offers to K-12 schools. 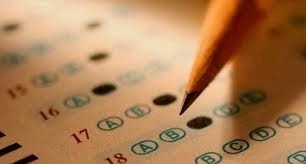 The ACT Aspire test will have "shorter and longer constructed-response questions, and the computer version will have technology-enhanced items that allow some interactivity. . . . There is no sign, however, that they will include the types of lengthy performance tasks that PARCC and Smarter Balanced are designing to engage students in more complex analyses." The tests are, of course timed. "A 30- to 40-minute English test, designed to gauge students' ability to revise and edit texts, will be composed of multiple-choice and technology-enhanced items." Exemplar items are posted online. The age-old conundrum is this compulsive need we have to measure what kids know and what they are able to do; a compulsive need to assign some sort of letter or number that says one kid seems to know some percentage points more than some other kid. I remember taking a history final in college when I had one of the worst cases of flu ever. Or so it seemed that day. I took my box of tissues with me and felt as though I needed to apologize for the constant nose-blowing. I'm sure it was disruptive to my classmates, but I had no choice. I made a C on that final. I should have made an A, but I felt miserable and I was distracted about being disruptive. I should have been home in bed. The final exam grade affected my overall grade for the class and, of course, my overall GPA. My professor knew I knew more and could have done better, but apparently felt handcuffed. Fair? No. Not for anyone. I agree with Michael that tests don't prepare kids for anything they will experience outside of the K-12 classroom. How do parents assess their kids' performance on chores? Is there a test for mowing the lawn? No. The evidence is in the work completed. Is there a test for a marching band on the field? Yep. Its performance. But not a written bubble test. Not even test with short or long constructed response. As I pondered this, it occurred to me that part of the challenge is that our country has a compulsive need to compare one state's kids to every other states' kids. We have a need to determine how well we are doing as a country so we can flex our academic prowess in the world. But test results can be manipulated. We've seen that time and time again as school districts make decisions about how and when to test which kids, and what to do with certain at-risk populations so they are tutored or classified or worked with in specific ways so as not to ruin the attempt at the passing benchmark. Because every school and every school district is focused on getting a passing grade! There are no easy solutions to this assessment problem because the issues are systemic and deeply entrenched. I wonder what would happen if teachers simply stopped giving standardized tests or even giving regular tests. I wonder what would happen if teachers simply started asking their students to do more realistic work and started assessing them in ways that would encourage self-reflection about their learning and that would encourage them to think about themselves as learners. Thanks for continuing the conversation! I agree that PBL is a great pedagogical way to move away from test-based assessments and toward a more realistic and helpful way for students to grow. We do live in a competitive society, and that is reflected in our practices in education. And, while competition works for some, it hinders many more. This goes for students, teachers, and schools. When we are competing with one another, we aren't learning from one another. I can't help but think that the more we test, the more we destroy students' passions for what they are learning. I am an avid runner and photographer. I do those things because I love them. If I had to take photography tests or running tests, I'm sure I would enjoy those things less. I'd probably stop doing them because my focus would shift from the intrinsic pleasure I get from those activities to my performance on the tests. Instead of learning all I could because I enjoy improving, I'd do what I had to in order to pass the tests. I think the same thing happens in schools. Kids jump through our hoops because they are coerced. Not because they have any love for the learning itself. I understand your underlying point made here in your comment and over at your own blog. However, I have one question for you. You say that taking photography tests or running tests would decrease your enjoyment of taking photos and running. Why do you automatically know this to be true? I saw tests as interesting challenges. Granted, I was not hung up on grades (and consequently earned any number of C's and B's when I felt I understood material at a higher level) but the simple act of testing did not diminish my enjoyment of the things I enjoyed. It certainly enhanced my sense of annoyance with material I did not want to think about.